These Sony noise cancelling headphones are only £199 (down 40% from £330) this Black Friday, but should you buy them? As the Black Friday game deals begin to wind down (well, at least until Cyber Monday), it can be easy to fall into a false sense of security. "All the best deals are done", we say to ourselves, "I can just log offline safe in the knowledge that I won't miss out on anything new." WRONG. The Black Friday deals never end. They are unceasing, and we must see them through to their conclusion. 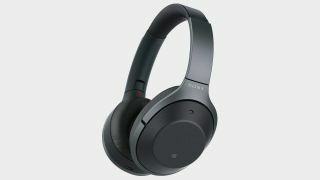 Take a look at these Sony WH-1000XM2 noise cancelling headphones, for instance, which have popped today as a late-game Black Friday deal that's mightily tempting. Amazon UK are offering these bad boys at a 40% discount, down £131 from its original RRP £330 to a smooth, tasty price point of just £199. Price-wise, then, it's a no brainer, but are these Sony headphones actually any good? And, more importantly, should you buy them? We're here to tell you that, yes, you should, with a total breakdown of what makes these WH-1000XM2s worth the purchase. Sony's WH-1000XM2's come equipped with Atmospheric Pressure Optimising, which allows it to obscure sound during flights on a plane, when the changes in altitude (not to mention the booming whir of the turbine engine) can often reduce the effectiveness of most other noise cancelling headphones. That's certainly neat, but what about the power of their noise cancelation at ground level? In short, perfect. The WH-1000XM2 has three modes; one which completely obscures any outside sound (very effectively, it must be said), an ambient noise mode which only accepts medium to high frequencies, and a Quick Attention mode which turns off the noise cancellation altogether. That latter feature is perfect for those common occurrences when you need to briefly speak to someone (say, at a coffee shop on your morning commute), but don't want the hassle of having to take off the headphones themselves. Just a quick flick of the switch on the side of the ear can, and you can suddenly hear everything. It's often been the case that a headphone's noise cancelling ability is directly tied to its sound quality. The better the noise cancellation power, the worse the overall textures of the sound itself. That isn't the case with the 1000XM2s. These babies offer crystal clear, reactive sounds that stay consistently strong regardless of the environment you might be using them in. That's thanks to its virtual surround sound system, which optimises the audio to complement what's going on around you, how loud it is, and even what you're wearing. Better yet, you can tailor the experience with the 1000XM2's Sound Position Control feature, which lets you choose the direction you'd prefer the sound to come from. It all holds up well in wireless mode, too, regardless of whether you're using an Android or iOS device, with a battery life that can comfortably last up to 30 hours before needing a quick recharge. With its, modest, sleek, matte black frame (also available in white), the 1000XM2s look great, and they feel it too. An ergonomic mixture of metal, foam, and only a dash of plastic, Sony's minimalist design ensures the headsets are firm and comfortable in equal measure, unlikely to break upon falling off your head, but also lightweight enough to not feel obtrusive when wearing them over long periods of time. The easy touch operation system means that there's few buttons to fiddle around with, too, but it's all smartly designed to ensure that you're always in control of experience when customising. The 1000XM2s also come with a swanky carry case that the headphones can neatly fold into, and there's even an added adaptor for charging during those audio optimised plane journeys, too. Sony WH-1000XM2 headphones - Should you buy them? Yes, preferably if you're on the market for some new portable headphones to listen to all that music and on-the-go entertainment (have a look at the Black Friday Nintendo deals for some good Switch offers right now). Gamers may want to browse the best PS4 headsets and Xbox One headsets for something tailored more specifically to your console of choice, but the 1000XM2s, with their reliable fidelity and slender build, are still a fine choice for that kind of experience nonetheless. With that 40% discount, too, this is basically an unmissable opportunity that Amazon won't be offering again anytime soon, so we strongly suggest grabbing it while it's hot.